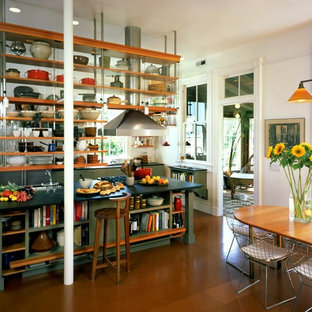 Kitchen island with suspended shelves above. Photos by Linda Svendsen. 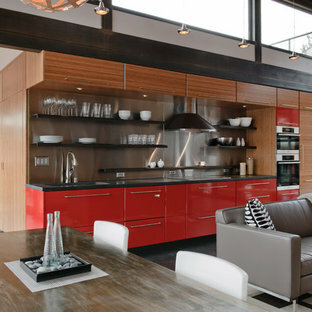 Clean and simple define this 1200 square foot Portage Bay floating home. After living on the water for 10 years, the owner was familiar with the area’s history and concerned with environmental issues. With that in mind, she worked with Architect Ryan Mankoski of Ninebark Studios and Dyna to create a functional dwelling that honored its surroundings. The original 19th century log float was maintained as the foundation for the new home and some of the historic logs were salvaged and custom milled to create the distinctive interior wood paneling. The atrium space celebrates light and water with open and connected kitchen, living and dining areas. The bedroom, office and bathroom have a more intimate feel, like a waterside retreat. The rooftop and water-level decks extend and maximize the main living space. The materials for the home’s exterior include a mixture of structural steel and glass, and salvaged cedar blended with Cor ten steel panels. Locally milled reclaimed untreated cedar creates an environmentally sound rain and privacy screen. Photography by Eduard Hueber / archphoto North and south exposures in this 3000 square foot loft in Tribeca allowed us to line the south facing wall with two guest bedrooms and a 900 sf master suite. The trapezoid shaped plan creates an exaggerated perspective as one looks through the main living space space to the kitchen. The ceilings and columns are stripped to bring the industrial space back to its most elemental state. The blackened steel canopy and blackened steel doors were designed to complement the raw wood and wrought iron columns of the stripped space. Salvaged materials such as reclaimed barn wood for the counters and reclaimed marble slabs in the master bathroom were used to enhance the industrial feel of the space. Our client wanted a unique, modern space that would pay tribute to the industrial history of the original factory building, yet remain an inviting space for entertaining, socialising and cooking. 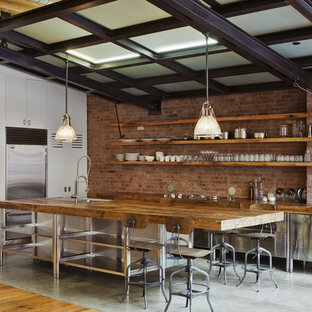 This project focused on designing an aesthetically pleasing, functional kitchen that complemented the industrial style of the building. The kitchen space needed to be impressive in its own right, without taking away from the main features of the open-plan living area. 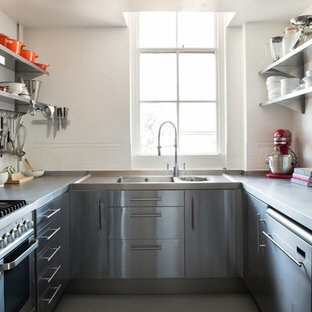 Every facet of the kitchen, from the smallest tile to the largest appliance was carefully considered. A combination of creative design and flawless joinery made it possible to use diverse materials such as stainless steel, reclaimed timbers, marble and reflective surfaces alongside integrated state-of-the-art appliances created an urbane, inner-city space suitable for large-scale entertaining or relaxing. This compact walk-in pantry is perfect for storing the microwave and bar fridge. We love the use of a blackboard wall for you shopping list and recipe ideas. There's even a spot for the dust buster! Copyright @ Emily Andrews. All rights reserved. This shaker style kitchen with an opaque lacquer finish shows a "L" shaped layout with an island. Storage space is the main concern in this room. Undeniably, the designer has focused on maximizing the amount of space available by having the cabinets installed up to the ceiling. 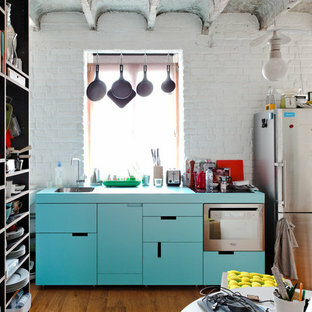 An entire wall is dedicated to storage and kitchen organization. Glass doors with stainless steel framing bring lightness and refinement while reminding us of the appliances and hood’s finish. 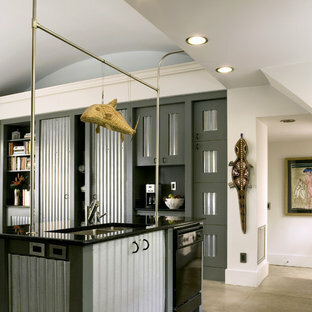 This kitchen has an eclectic style, but one that remains sober. The monochromatic color palette allows all components to be well integrated with each other and make this room an interesting and pleasant place to live in. 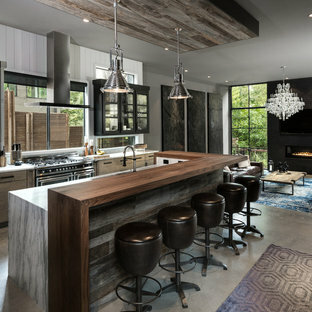 Several classic elements like shaker doors and a "subway" style backsplash are diminished by the industrial aspect that bring the concrete island, the massive stainless steel hood and the black steel stools. Tiled windows remind us of the windows of largeMontreal’s factories in the early 30s, and therefore add to the more industrial look. 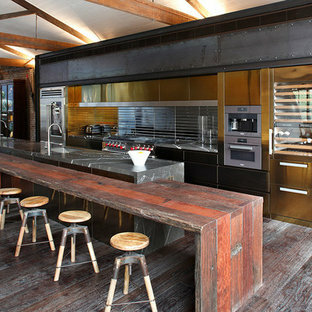 The central element and a major focal point of this kitchen is unquestionably the concrete island. It gives this room a lot of texture and interest while remaining sober and harmonious. 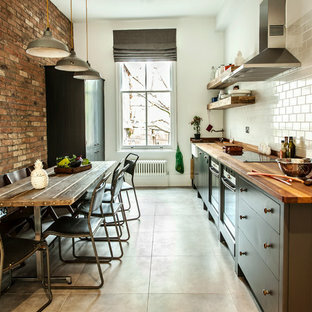 Black steel stools contribute to this urban and industrial aspect thanks to their minimalist and quaint design. A white porcelain farmhouse sink is integrated impeccably with the cabinets while remaining discreet. Its specific shape adds character to the kitchen of thisWestmount’s house, built in 1927. 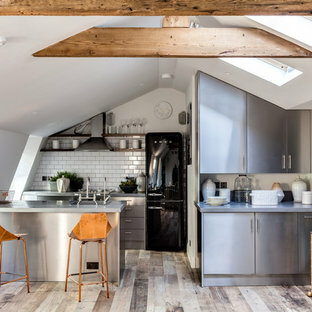 Finally, the wood floor just brightens up and warms the atmosphere by creating a sustained contrast with the rest of the kitchen. In the dining room, a gorgeous antique solid wood table is also warming up the space and the upholstered chairs add comfort and contribute to a comfortable and welcoming ambience.